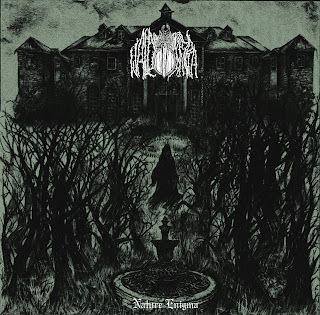 Wald Krypta are an international duo with members from Canada and the United States that plays a very raw and old school form of black metal and this is a review of their 2018 album "Nature Enigma" which will be released in November by Eternal Death Records. Drums and clean playing start off the album before going into a very fast and raw musical direction which also uses a great amount of tremolo picking and blast beats while the vocals a re mostly grim black metal screams along with the music also being very heavily influenced by the 90's French style. The first song is very long and epic in length while the solos and leads are done in a very dark, raw and melodic style along with some clean playing also being used briefly along with some tracks also bringing in a decent mixture of slow, mid paced and fast parts and the music also invokes a very lo-fi atmosphere and they also bring in an instrumental track. Wald Krypta plays a style of black metal that is very raw in the 90's French tradition, the production sounds very dark, raw, lo-fi and old school while the lyrics cover Anti Religion and the worship of the power of death and decay.